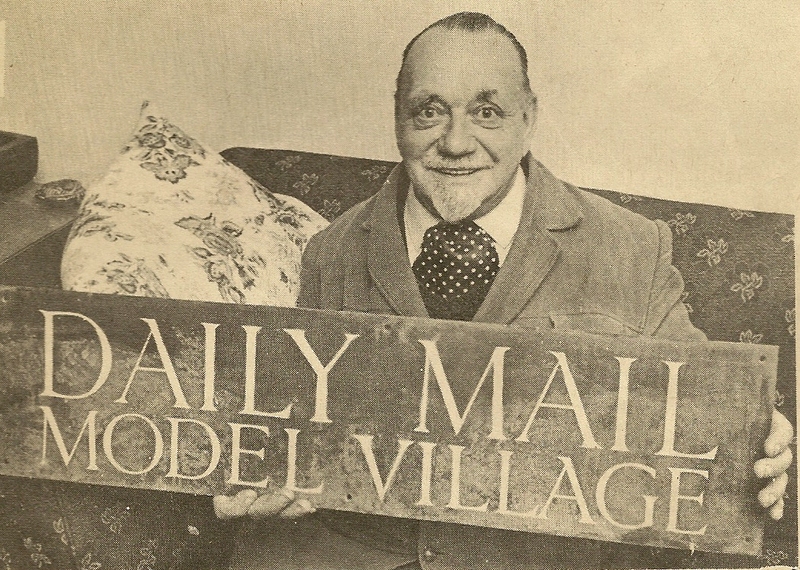 Fred Garrod and the Daily Mail Model Village sign recovered from the Handside Lane pond. This article was published in the Welwyn Times and Hatfield Herald on 10 October 1969. It is reproduced here with the permission of The Welwyn Times. Nearly 50 years ago, as a young man of 19, Fred Garrod came from Essex to settle in the new town that Ebenezer Howard and his colleagues had started to build as a new venture in town planning.At that time Welwyn Garden City consisted only of hutments on what is now The Campus area and a few houses in Brockswood Lane, Dognell Road and Applecroft Road.Fred, a maintenance engineer, lodged first in a house in Applecroft Road and worked on a poultry farm in Handside Lane. He soon made up his mind to settle in the Garden City and eventually he became a Labour member of the Urban District Council, chairman of the town planning committee and of the road safety committee.He went to live in one of the houses in Guessens Road which he watched being built, and became chairman of the WGC Marriage Guidance Council, the Footpaths Association, a founder member of the Wine Makers’ Guild and a member of the Craft Workers’ Guild. In this article Fred, now 67 [ed note: in 1969], recalls some of his early reminiscences of the first years of the Garden City. “A sign which the Daily Mail erected was damaged and they threw it into the pond. It was part of my father’s job to keep the pond clean, and one day when he was clearing the reeds he hooked up the sign”. Mr. Garrod has since preserved the sign which he is here seen holding at his home in Guessens Road. I first walked to the town in May, 1921, from Welwyn under the viaducts up the old road which ran through Digswell Lodge Farm, then along a cart track, over a level crossing at Junction Cottages, coming out into what is now Bridge Road at the back of the Cherry Tree, writes FRED GARROD. This was a series of Army huts, but a very friendly place in those days as it was the only pub in the town. The Woodman was just a cottage, the Beehive and the Waggoners were nice walks across fields. Brockswood Lane and Handside Lane were the only roads, and very rough at that; if you were cycling you had to be careful or you went into a nice skid on loose gravel. The station was a wooden hut in front of the Cherry Tree, with a wooden platform, and used to be crowded on a Sunday evening. I remember being on there one Sunday when the place was crowded with people going back after visiting the town and relatives when a dog fight started right in the middle of them all. There was pandemonium in a few seconds and it looked as if some would land on the track, but fortunately one of the owners managed to get his dog away and all settled down to await the train from Luton. We had to change at Hatfield in those days to catch the London train. We also had to go to Hatfield and change to go to St. Albans as there were no buses. The council offices and banks in those days were wooden huts. There was also a camp for men in the building trade standing on what is now the Campus. As there was no road across the line, the bridge and road to Digswell was built after the camp went. The only shop was Welwyn Stores which stood between what is now Parkway and Guessens Road. This was like a store you wouldfind in the Middle West; everybody met there on Saturday afternoons. Cricket used to be played on the site of the present Co-op shop [ed note:now Debenhams] in Stonehills. We used to have some large fairs camped there during the summer and the church school meetings used to be held in one of the wooden huts on the Campus. Some of the early plays were presented in the Barn at Brick Wall Farm. Later came the Lawrence Hall and later still came what was called the Store Annex. This provided cinema, church, auction sales and schoolplays, and a display centre for hardware, etc. Where the green enters Chequers there was a huge refuse dump for London refuse.The continued use of this dump became an annoyance to residents who moved in when Woodhall Lane was built. All the farms were in full production: Woodhall Lodge, Digswell Lodge, Upper Handside, Lower Handside. Cows from Upper Handside where the pond was, used to be driven down Handside Lane to graze on the meadows lower down. This pond was turned into a very pretty spot – the banks were turned into rockeries and water lilies and flowers were planted. It was in this pond that the Daily Mail plaque was thrown. My father worked for Digswell Nurseries and was provided with a raft to keep down the weeds. One day he raked the plaque out of the pond and I have it still. The farmhouse was turned into a hostel and the buildings into a dairy for Welwyn Stores. The Barn eventually became the well known Barn Theatre. The lower farmhouse was still being lived in by the Horn family and the old gentleman was still alive. I remember one day when they had just started buildingBarleycroft Road and there was a big lorry loaded with bricks stuck in the mud right down to its axles. The old gentleman was coming down the lane, he turned to me and said: “Ah boy! They can’t get them things about exactly like you can a wheelbarrow, can they?” Later the farmhouse was used as an overflow for Handside School, and one of the cart sheds is now the Backhouse Room. Mention was made of the breakdown of the water supply. There were several deep wells on the estate, and the one in use was at the top of Handside Lane, and used to be turned by a large wheel by hand. If my memory serves me correctly, this was taken off, and a pulley put on and worked by a driver from a stationary engine. The reservoir was in the wood. When this plant broke down we volunteered to go round with water carts, two pails of water from the pond to wash with and one pail for cooking and drinking from some healthier source. A lighting main was run across the fields to Digswell as the new pumping station was nearly complete and the taps were soon running again. The lovely red bricks the early houses were built with were produced in the company’s own brickworks situated in the wood behind the old Welwyn builders yard, supplemented by some of the same kind from Fenwick Owens yard at Ayot Green. I remember one Sunday morning Sammy Welch, a well-known character in the early days, and I were ferreting in Old Stanborough Lane opposite 20th Mile Cottages when the ferret laid up. This meant digging, so we dug down and Iwas head and arms down the hole when I heard a commotion up above. When I extricated myself I found Sammy and Mr. Legge, a company official, having an argument. He apparently had told Sammy he had no right to damage the bank in this manner. Sammy told him in no uncertain terms that he had permission and did not want the townies telling him about country jobs that he had been doing all his life. Of course, there were many adjectives thrown in by Sam,I don’t think Mr. Legge had heard so many before. In those days there were no footpaths as we have today. Light railways ran along the verges all over the town carrying bricks and building materials. The local election days were great fun. Campaigns went on for weeks before and all candidates had to give their election address on the same platform. The halls used to be packed and question time was real fun. In about 1926 we were all snowed up. It rained all Christmas Day but in the evening it blew a blizzard and went on all night and part of Boxing Day. The North Road was blocked and there was 2ft. of snow in the City. The branch line from Hatfield to St. Albans was completely blocked. There were 6ft. drifts in some places in the town and there was only one track clear on the North Road for days. The snow had to be carted away in lorries and no work could be carried out on the buildings or gardens for weeks. Another unusual event occurred about 1929, during one night in November. It started blowing and the wind reached gale force, stripping tiles off houses, smashing large hoardings and completely destroying some large poultry houses in the fields at the bottom of Handside Lane. Heavy sections were carried quite a distance. The worst tragedy, of course, was the great train crash outside the station one Saturday night when several people were killed. These are some of the things that happened in those early days when there was always plenty to do. There were always some of the leading politicians visiting the town to give their views at meetings in the Cherry Tree ballroom or the Parkway Restaurant, including George Lansbury, Lady Cynthia Mosley , Jimrny Maxton, Tom Mann, Harry Pollitt and Lord Dawson of Penn. 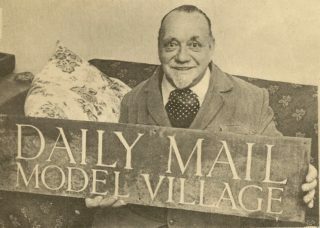 The original Daily Mail sign found in the pond is now looked after by the Mill Green Museum, and sponsored by the Jolly family, who lived in Meadow Green for about 60 years.